Computex Gigabyte wasn't to be left behind by rivals Asus, MSI and Acer at this year's Computex - it too unveiled a compact laptop based on Intel's just-launched Atom N270 processor. 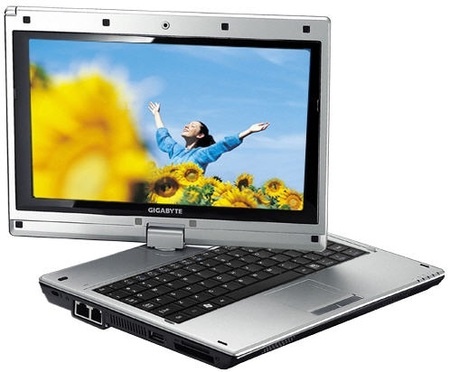 Enter the M912, a compact, 1.6GHz system with an 8.9in display - this time with an above-par 1280 x 768 resolution - integrated 1.3-megapixel webcam, 10/100Mb/s Ethernet, 802.11b/g Wi-Fi, 1GB of memory and a 4GB solid-state drive. 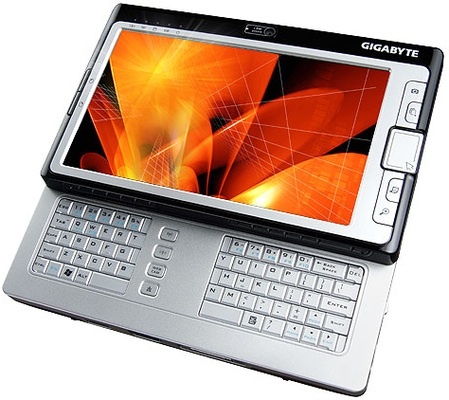 In addition to the larger-than-usual screen resolution, the M912 comes with Bluetooth - most Small, Cheap Computers™ don't - but perhaps the Gigabyte machine's standout feature is its tablet design. It's not original - Dialogue's Flybook is a sub-notebook with a turn-and-fold-screen and it's been out since 2004 - but the Gigabyte version comes with Linux so is free of all that Windows XP Tablet PC Edition nonsense. The M912's display is touch-sensitive. The M912 is also more expandable than many of its rivals: it has an (empty) 2.5in bay for an additional 9.5mm-thick hard drive, and an ExpressCard slot. With a four-cell, 4400mAh battery fitted, the Gigabyte weighs 1.2kg - more MacBook Air than Eee PC. The company claimed the unit can run for up to four hours on a single charge. Gigabyte also showed off its M700 UMPC - a 7in, 1024 x 600 device equipped with VIA's 1.2GHz C7-M ULV processor, 768MB of 533MHz DDR 2 and a choice of 40GB or 60GB of hard drive capacity. It'll come with Windows XP and the usual connectivity options. The M528, meanwhile, comes in the same slider design as the M700, but it's a smaller unit with a 4.8in, 800 x 480 display. 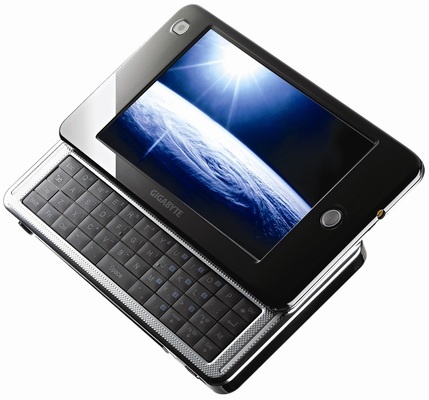 It's a handheld mobile internet device, in other words, rather than a UMPC. Like the M912, it runs Linux and has 4GB of on-board SSD storage. It has 512MB of memory and an 800MHz Atom CPU. It's got mini USB and regular USB ports, and in addition to 802.11b/g Wi-Fi there's a space for both an optional HSDPA module and a SIM card. It has GPS on board too. The 340g unit has a front-facing 0.3-megapixel webcam and a three-megapixel auto-focus camera on the back. Its got a 2700mAh battery, but Gigabyte didn't say how long it'll run for. Nor did it say when these three gadgets will appear over here.